Gundrill tools are used in hole applications of 0.5 mm [0.02 in] to 50 mm [2.00 in] in diameter. Gun drilling tools for use in UNISIG deep hole drilling machines are provided by world leading cutting tool manufacturers, and chosen based on extensive experience with tooling manufacturers and applications, to meet customers’ performance and production goals, even in challenging applications. 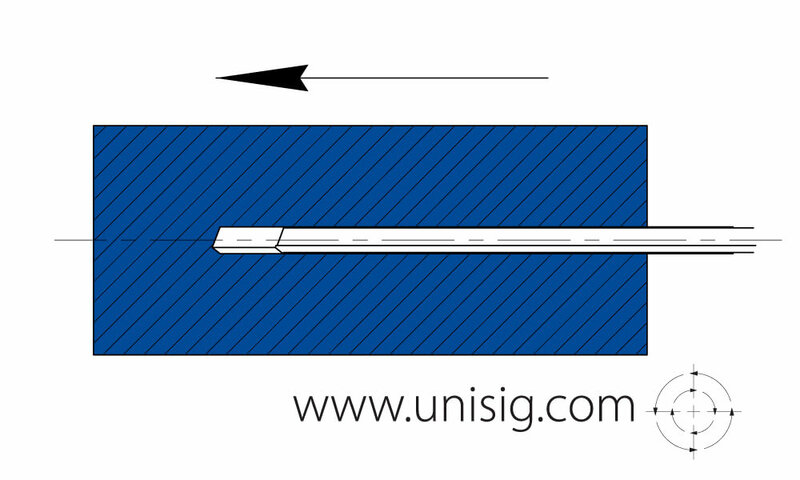 UNISIG works with all of the major gun drill manufacturers, and has established strong, engineering level relationships with each, to provide optimal solutions to our customers. UNISIG supplies gundrills for process collaboration projects, turn key systems, and drilling service and testing in our tech center. Gundrill tools are otherwise recommended based on our extensive engineering and practical experience with both gundrill tools and deep hole drilling applications. Gundrill tools are perishable tooling components that introduce coolant through the machine spindle and middle of the tool, and exhaust chips in a groove down the length of the tool, for extremely precise deep holes in metal workpieces. Gundrills can be sharpened several times to extend their life using a specialized grinding system, or CNC cutter grinder. Additionally, special forms can be ground into gundrill tooling tips for form tool operations. Click to learn more about the gundrilling process. Gundrills are available in solid carbide, brazed, and indexable tools. Solid carbide gundrill tools have a cutting tip and tool body manufactured from a single piece of carbide, which is brazed into the tool driver. Solid carbide gundrills are very rigid, and therefore able to achieve high feed rates and high accuracy. Their typically short length allows them to be re-sharpened and recoated with conventional equipment, for high volume production use at peak performance. The maximum overall length of solid carbide gundrill tools is limited, and initial expense is higher than brazed gundrills, particularly as the diameters increase. Brazed gundrill tools are constructed with a carbide tip brazed to an alloy steel shank and driver. These tools can be produced in virtually any length required, and are economical. Brazed gundrills are very common due to their versatility, relatively low cost, and short lead time to manufacture. Brazed gundrills are less rigid than solid carbide tools, and will have reduced feed rates and accuracy potential in smaller sizes. Indexable gundrills have a machined steel shank and driver, with replaceable cutting inserts and wear pads. These tools can achieve very high feed rates, and provide the convenience and economics of indexing the carbide insert and wear pad rather than sharpening the tool. The drilled-hole diameter is typically less precise than a solid carbide gundrill or brazed gundrill, both of which have the head ground to the finished diameter, rather than relying on machined insert pockets with larger manufacturing tolerances. The initial expense of the indexable tools is higher than a comparable brazed tool, so they are generally applied in higher volume applications. Gun drills work as part of a system with deep hole drilling machines and durable tooling. Request information on gundrill tools, or submit your application for review.